This elegant, two-story, 3128 sq.ft. plantation-style home offers top of the world views of three mountain ranges. 4 BR/4 BA. A covered, wrap-around porch on each level. Offered furnished. The 12.65 +/- Acre property borders Shoshone National Forest for direct access to year-round outdoor recreational opportunities. One-of-a-Kind location and design. 3668 sq. ft. Custom Home with expert woodwork and creative craftsmanship in every detail. 3 BR/4 BA. Built on two levels with a Sun Room on each level and wrap around decks from which to enjoy the beautiful mountain views. 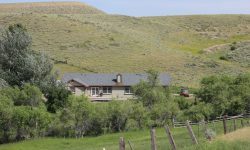 1.57 Acres +/- in Long Creek subdivision which is surrounded by Shoshone National Forest. Mountain Cabin in the forest. 1 acre deeded land, in Buck and Rail Estates, adjacent to Shoshone National Forest. 2 BR/2 BA with loft for extra sleeping area. Beautiful views of the Wind River Mountains. 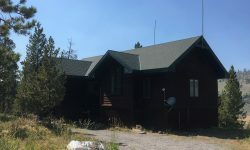 Walking distance to the Wind River and excellent fishing. Just off Hwy 26, 22 miles west of Dubois, WY and less than 70 miles to Jackson. Grand Teton and Yellowstone National Parks are a scenic 1+ hours drive away. Access the Continental Divide Snowmobile Trail system and enjoy a winter wonderland. Conveniently close to Lava Mountain Lodge and Wilderness Boundary Restaurant. Bring your snowmobiles, ATV’s, hunting and fishing gear. Horses allowed too. The popular Union Pass area, west of Dubois, WY, offers year round recreational opportunities right out your front door. Level 3.17 Acres. 1350 Sq. Ft. home with loft. Two Bedrooms, a 3/4 Bath, and two heating stoves–a wood-burning stove and a gas stove. Detached single-stall garage and additional outbuildings including an 800 sq. ft. equipment storage building. The cozy Sun Room adds passive solar heat and a place to indulge your green thumb. Enjoy panoramic mountain views and the ever-changing big sky. Less than 1/4 mile to National Forest public lands access. Restrictive covenants apply.